Here you fill in your personal data such as shown above. Full name: Your regular name. Email Address: Your E-Mail address. Nickname: Just fill your nickname that will be shown if you enter a channel. Alternative: Just fill a second nickname if your previous nickname is occupied on IRC. Then press Advanced and you will get this window. 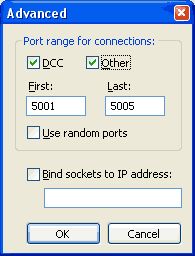 Next you change your DCC Ports First to “5000” and Last to “5005” (Already Set-Up). Every port that's open means you can have that amount connections to other connections. Meaning (using this set-up) you can have 6 downloads going or connect to max 6 fservers at the same time. Why Limit Your Ports? Because you don’t need a big range of ports, Second if you have a firewall or Router you don’t have to open many ports. You may choose your own range of ports if you like. 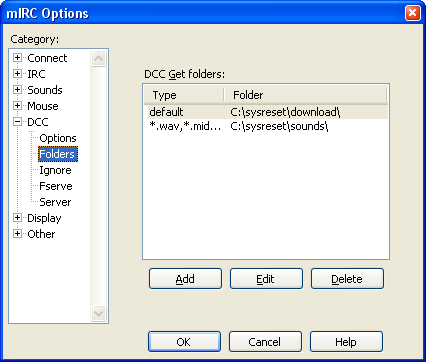 Here you must click on “Edit” to select the folder where your download must go to. You will get the following screen. 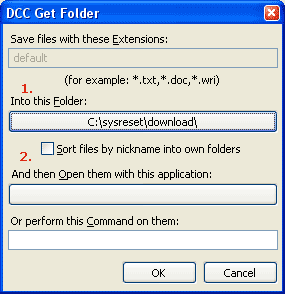 Click on “Into this Folder” and select the download directory. So each time you receive a file it will be automatically scanned by your virus scanner. Then press twice on OK. These are the basic configurations of mIRC.